MMR vaccine is it safe or effective? You be the judge based on the medical literature that is available to you. 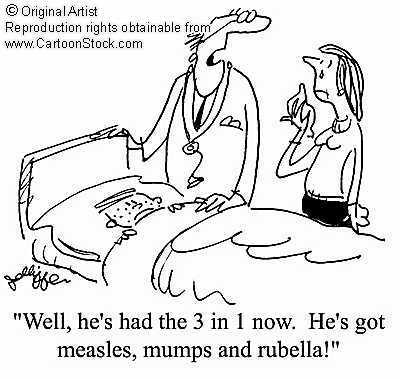 The MMR vaccine consists of 3 live viruses for Measles, Mumps and Rubella. The MMR-V has live chicken pox added to the mix. It contains a weakened or partially inactivated, live measles virus which is grown in cell cultures of a chick embryo. A weakened live strain of mumps virus is grown in cell cultures of a chick embryo. A weakened Wistar RA 27/3 strain of live attenuated rubella virus which is grown in human diploid cell (W-38) culture originating from the tissues of a fetus aborted in 1964. There is no preservative such as Thimerosal(mercury). It contains the antibiotic neomycin, and Sorbitol and Hydrolyzed Gelatin as stabilizers. All three live viruses are available as single vaccines but doctors will most often tell you they are not available, or refuse to give them as separate vaccines. Mumps vaccine virus genome is present in throat swabs obtained from uncomplicated healthy recipients. Seven children were followed for up to 42 days post-vaccination with live mumps vaccine and 37 throat swabs were obtained serially. Viral genomic RNA was detected by reverse transcription-polymerase chain reaction (RT-PCR) in the phosphoprotein (P) and hemagglutinin-neuraminidase (HN) regions. Virus isolation was also attempted. Genomic differentiation of detected mumps virus genome was performed by sequence analysis and/or restriction fragment length polymorphism (RFLP). No adverse reaction was observed in these children. Although mumps virus was not isolated from any of the samples, viral RNA was detected in four samples from three vaccine recipients, 18, 18 and 26, and 7 days after vaccination, respectively. Detected viral RNA was identified as the vaccine strain. Our data suggests that vaccine virus inoculated replicates in the parotid glands but the incidence of virus transmission from recipients to other susceptible subjects should be low. Any reactions that are 6 – 14 days are the measles component and usually show as temperature and rash, and sometimes seizures. The second phase is between 11 and 32 days which is the mumps components. This can consist of temperature, seizures, and acquiring mumps. The third phase can occur within the first 0 – 30 days, and is the rubella component. It can cause joint pain or arthritis. This most often occurs in adolescents and adults, and perhaps babies, but they wouldn’t be able to tell you. Delaying MMR until a child is older makes it ‘safer’? The reality is there is no ‘safe’ time to delay as reactions can occur at any time if the conditions are right. A 6 year old, or 12 year old child, or a young adult can have serious reactions or death associated with the vaccine. Parents can opt to have titer tests done first. AAP Study: Relationship b/t MMR & Encephalitis w/ Perm. Brain Injury or Death. The purpose of this study of claims submitted to the National Vaccine Injury Compensation Program is to determine whether or not there is evidence for a causal relationship between the first dose of a currently used attenuated measles vaccine, MR, MMR, mumps, or rubella vaccine and encephalopathy of undetermined cause with permanent brain injury or death that occurred within 15 days after administration. A total of 403 [compensation] claims of encephalopathy and/or seizure disorder after measles, MR, MMR, mumps, or rubella vaccination were identified during this 23-year period [1970-1993]. Of these claims, 48 (25 males and 23 females) met the inclusion criteria and acquired an acute encephalopathy of undetermined cause 2 to 15 days after receiving measles vaccine, MR, or MMR. This acute encephalopathy was followed by permanent brain impairment or death. The patients ranged in age from 10 months to 49 months, with a median age of 15 months and a mean age of 17.5 months. A total of 48 children, ages 10 to 49 months, met the inclusion criteria after receiving measles vaccine, alone or in combination. Eight children died, and the remainder had mental regression and retardation, chronic seizures, motor and sensory deficits, and movement disorders. The onset of neurologic signs or symptoms occurred with a nonrandom, statistically significant distribution of cases on days 8 and 9. No cases were identified after the administration of monovalent mumps or rubella vaccine. Sally Beck wrote an article on the study at Wake Forest University School of Medicine in North Carolina titled “Scientists fear MMR link to autism”, which was similar to the one reported by Andrew Wakefield, MD, in 1998. So here we have two studies that are contradictory. What are the differences between the two studies? In the U.S. study, measles virus genomic RNA was actually found in the gut of 70 affected children and the viral results of another 200 children with typical gut pathology are still pending. In the U.K. study, the researchers “could not detect” measles virus genetic material in the blood of 15 MMR-vaccinated children with autism. It is essential to also point out that the above-mentioned M.A. Afzal is not N.A. Afzal, a pediatric gastroenterologist attached to the Centre for Pediatric Gastroenterology at The Royal Free Hospital, London, U.K. It was at the Royal Free Hospital that Andrew Wakefield practiced gastroenterology for years and where he was the shining star before he dared to “rock the boat” and was forced to resign. It is also at the Royal Free and University College Medical School in London that Brent Taylor, one of Wakefield’s most vocal critics, is professor of community pediatrics. N.A. Afzal published his first study with the Royal Free team in December 2002. He published two more studies in 2004 and one in 2005. The abstracts of all four studies did not contain any reference to autism and vaccines. M.A. Afzal, on the other hand, is a member of the virology department at the National Institute for Biological Standards and Control (NIBSC). The Institute is a respected multi-disciplinary scientific establishment with national and international roles in the standardization and control of biological substances including viral and bacterial vaccines. Since 1976, the institute has been directly funded by the United Kingdom Health Departments. Kawashima discovered and reported that “the sequences obtained from the children with autism were consistent with being vaccine strains” and that the results were concordant with the exposure history of those children. So how come Team Tokyo found vaccine-strain measles virus genomic RNA in peripheral mononuclear cells of vaccinated autistic children in 2000 and Team U.K. found nothing in 2006? The answer to that perplexing and rather sensitive question may be in a very interesting study that was published in the Journal of Medical Virology in May 2003, titled appropriately “Comparative evaluation of measles virus-specific RT-PCR methods through an international collaborative study” and authored by both Afzal and Kawashima, in addition to renowned experts A.D. Osterhaus, S.L. Cosby, L. Jin, J. Beeler and K. Takeuchi. Afzal and colleagues published “Absence of detectable measles virus genome sequence in inflammatory bowel disease tissues and peripheral blood lymphocytes” in the Journal of Medical Virology. According to the authors, in spite of using a “highly sensitive measles-specific RT-PCR-nested PCR system,” they failed to detect the presence of measles virus in 93 colon biopsies and 31 peripheral blood lymphocyte preparations, examined and obtained from patients with IBD and non-inflammatory controls. It seems from the above that M.A. Afzal was looking for evidence of viral presence in the colon (large intestine) and did not find any. Wakefield had better luck, a little later, when he looked for such evidence in the ileum. Afzal was certainly aware that the children tested by the Royal Free Team had ileal lymphonodular hyperplasia. In April 1999, Wakefield, Montgomery and Pounder published “Crohn’s disease: the case for measles virus.” They reported, “We and others have suggested that measles virus may be causally related to Crohn’s disease, and that the associated risk is an atypical pattern of exposure. The data for Crohn’s disease suggest that persistent infection may follow early low dose exposure and low zone immunological tolerance. The changing pattern of measles virus exposure this century would be consistent with a shift toward lower dose of infection. Such an exposure would also be consistent with persistence of the virus at very low copy number within discrete foci of granulomatous inflammation..” Afzal, Minor, Armitage and Gosh published “Measles virus and Crohn’s disease” in June of the same year. “Measles, mumps, rubella vaccine: through a glass, darkly,” Wakefield and Montgomery reviewed the safety testing of MMR vaccine or lack thereof. There’s more bad news for advocates of the MMR (measles-mumps-rubella) vaccine with the discovery this week that it can cause a blood disorder. Researchers have found that it may trigger immune thrombocytopenic purpura (ITP), an immune system malfunction that destroys the body’s own blood platelets. The effect seems to last for an average of seven days, during which time the child’s platelet count could fall. The risk is relatively low, say researchers, and one case of ITP will be caused per 40,000 vaccinations. The risk appears to last for up to 42 days after vaccination. Researchers from Kaiser Permanente Colorado, Denver analyzed the health profiles of more than 1 million children who had been vaccinated. Of these, 259 developed ITP, and they reckon the vaccine was responsible for 76 per cent of these cases. (Source: Pediatrics, 2008; 121: e687-e692). Persistence of Measles, Mumps, and Rubella Antibodies in an MMR-Vaccinated Cohort: A 20-Year Follow-up. The present study was performed to determine whether acetaminophen (paracetamol) use after the measles-mumps-rubella vaccination could be associated with autistic disorder. This case-control study used the results of an online parental survey conducted from 16 July 2005 to 30 January 2006, consisting of 83 children with autistic disorder and 80 control children. Acetaminophen use after measles-mumps-rubella vaccination was significantly associated with autistic disorder when considering children 5 years of age or less (OR 6.11, 95% CI 1.42-26.3), after limiting cases to children with regression in development (OR 3.97, 95% CI 1.11-14.3), and when considering only children who had post-vaccination sequelae (OR 8.23, 95% CI 1.56-43.3), adjusting for age, gender, mother’s ethnicity, and the presence of illness concurrent with measles-mumps-rubella vaccination. Ibuprofen use after measles-mumps-rubella vaccination was not associated with autistic disorder. This preliminary study found that acetaminophen use after measles-mumps-rubella vaccination was associated with autistic disorder. We know that acetaminophen impairs the glutathione pathways, as well as hormone balance. The glutathione pathways are the same ones involved in naturally “chelating” out metals. Acetaminophen can also suppress the immune system and when given with Gardasil, results in a lower antibody development. Thus it can crash some aspects of the immune system. So, if autism results from a situation where if the immune system is suppressed and nutrition isn’t quite right, the body is not able to clear out heavy metals, and then anything can make that situation worse and contribute to the problem. This study does not mean that MMR is not implicated, but that Acetaminophen was part of an overall negative equation. Children suffered higher rates of fever-related convulsions when they received the combination vaccine Proquad instead of two separate shots. The study (Nicola P. Klein, MD, PhD, a research scientist from Northern California Kaiser Permanente and co-director of the Kaiser Permanente Vaccine Study Center) which included children ages 12 months through 23 months, found the rate of seizures was twice as high in toddlers who got ProQuad, compared with those who got separate shots for MMR and Chicken Pox (Varicella vaccine). ProQuad was licensed in 2005 but had suspended production because of manufacturing problems. There is five times more chickenpox antigen in the ProQuad shot than in the Varicella vaccine. Possible increased risk for febrile seizures found among children aged 12 to 23 months after receipt of MMRV vaccine. According to The New England Journal of Medicine, 60 percent of all measles cases among American school children between 1985 and 1986 occurred in those who were vaccinated. The Journal of the American Medical Association published a study in 1986, which showed that among 235 cases of student measles reported in Dane County, Wisconsin; more than 96 percent had received a measles vaccine. A study reported in Morbidity and Mortality Weekly Report found that 58 percent of 1600 cases of measles in Quebec, Canada, in 1989 occurred in those who had already been vaccinated. The World Health Organization has conceded that those administered the measles vaccine have a 14 times greater likelihood of contracting the disease than those who remain unvaccinated. A study published in 1994 in the Archives of Internal Medicine evaluated all U.S. and Canadian articles reporting measles outbreaks in schools, and found that, on average, 77 percent of all measles cases in these outbreaks were occurring among vaccinated individuals. The authors concluded that “the apparent paradox is that as measles immunization rates rise to high levels in a population, measles becomes a disease of immunized persons. In 2007, a study performed at the National Institute of Communicable Diseases in South Africa reviewed the increase in mumps outbreaks in the UK and US. In the US, 56,000 cases were reported in 2004-2005. Many of these cases are occurring on college campuses. A mumps outbreak at a New York summer camp found that 96% of those infected had prior vaccination coverage. A similar outbreak in Nova Scotia among vaccinated adolescents and young adults has also been reviewed and it was found that the virus’ genotype was the same as that in the UK and US. These recent outbreaks have raised concerns among scientists about the effectiveness of the mumps vaccine in the MMR. According to the South African scientist, there may be a waning immunity towards mumps in the vaccinated population, which in time could make the vaccine ineffective. Belgian scientists came to the conclusion that the secondary mumps vaccination was a failure during a 2004 outbreak affecting 105 Belgian children from ages 3-12. As a consequence of the fact that antibody response to the vaccine virus is temporary, today we are facing cases of atypical measles occurring in infants under a year old, as well as in older children and in adults. Atypical measles is a severe disease that was first described in the early 70s in children, and later in adolescents and young adults exposed to the wild-type measles virus several years after being vaccinated with the killed or attenuated measles vaccine. The condition is characterized by atypical rash, high fever, cough, headache, and pneumonia. Further complications can include hepatitis, persistence of pulmonary lesions for several years, thrombocytopenia and other circulatory system problems, and cardiac involvement. Another problem found with measles vaccination, documented in several studies, is that it produces immune suppression that contributes to an increased susceptibility to other infections. The 60% of people who were vaccinated in 1970 have caused many of them to be susceptible to natural measles, because the shots were given too early. This is also why most analyses which profess to have a scientific element, go from the 1973 licensure. Atypical measles explained by James Cherry: (PMID: 14765342. Page 505).